Some of America's most active business airports would be - should be, having one of their most active weekends on this, the last weekend before the Labor Day holiday. Instead they look like this desolate scene at Westchester County Airport in White Plains, New York. In anticipation of Hurricane Irene, Westchester, Republic and Teterboro are reporting airfields that have become ghost towns. My friend, Chuck Allen, a pilot and member of the Westchester Flying Club spend part of Saturday afternoon watching a lot of takeoffs...and no landings...as people moved their airplanes out of the path of the hurricane. "When it comes to weather, pilots usually pay attention," Chuck told me in an email after writing to share with me the very odd sight of these normally hectic airports with all but tumbleweeds rolling down the airfield by this evening. 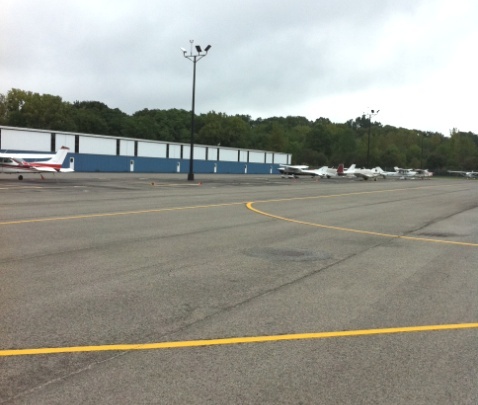 "Probably 70-80% of the planes normally parked at Panorama were not there," Chuck reported, referring to Panorama Flight Service, one of the fixed base operators at Westchester County. Ian, working in the operations office at Teterboro Airport in New Jersey, wouldn't even take a guess at how many planes were moved elsewhere in preparation for the storm, but he's the one who characterized the place as a "ghost town" this evening. Its not much of a stretch to imagine that general aviation and business airports from North Carolina to Massachusetts were also sending planes out at a steady clip. I'm guessing anyone inland with hangar space to spare has been approached by friends, friends-of-friends, and probably even complete strangers asking if - by squeezing and shuffling - more room could be made to put another airplane or two indoors. 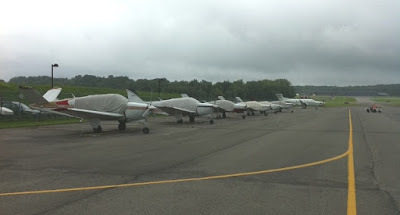 "The airplanes on the field are either in hangars or tied down with tiedown hooks in the pavements," I was told by the operations officer at Republic Airport in Long Island, which will shut down if and when winds reach a sustained 65mph. In an email to members of the Meetup group for Northeast Pilots, Clark Burgard offered a number of helpful tips to airplane owners; including using ropes with some elasticity to allow for shock absorption and reminders to secure step ladders and chocks as well as planes. That small stuff can do big damage when it gets tossed around the airfield by high winds. Clark moved his plane to Rochester, New York on Friday, an airport he chose because "it was out of the way of the storm, even if Irene tracked more inland." The last commercial flight to Westchester County Airport arrived at 6:00 p.m. Saturday and the airport will remain closed until Monday at 3:00 p.m., reflecting optimism that for all the wind and rain, Irene will not create lingering problems. Life back to normal by end of the day on Monday? We shall see. According to our local news, MRB has UH-1 helicopters from Andrews AFB and A-10's from the Maryland Air Guard tied down at every tie down spot on the field. Wish I could have gotten over there for some photos. At least the FBO will be happy to get all those tiedown fees! 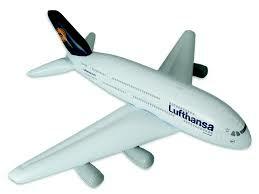 This morning I flew 3 miles abeam of JFK at about 9 AM. It was spooky! -- there was no traffic and Approach gave me "direct Bridgeport" from Sandy Hook! Looking down at JFK, it was really odd to see so few aircraft present (pic in blog post HERE). Presumably things will be back to what we laughingly call 'normal' in a day or two.